Americans loved Charles Dickens. When he toured the United States, we threw him dinners and flocked to see him. Though he never visited Geneva, the local newspapers often talked about him. The earliest reference was in 1837, when the Geneva Gazette of August 20 filled most of its front page with “The Warden and His Children,” from Sketches of Every-day Life, by Boz. “Boz” was Dickens’s pen name early in his career. The story must have been especially popular with the Temperance-minded, since it is a gloomy tale of lives ruined and cut short by the Warden’s alcoholism. The same paper advertised a more cheerful set of tales, though – the Bogerts and Wynkoop bookstore offered The Pickwick Club, in three volumes, “edited” by Boz. In 1841, the Courier printed a long letter from an American fan who had visited Dickens in England. The fan had written the letter originally to Washington Irving, but at some point it was published and passed around the country. I believe there is no English author now living who is so much admired and read by our countrymen as Mr. Dickens, and, consequently, no one respecting whom Americans may be supposed to have so great a desire for information. . . . There were many persons in our country who could not be prevailed upon to read his works for a long time after the publication of the Pickwick Papers. So many vulgar representations of Sam Wellar [a comic Cockney who made Pickwick the first publishing sensation] had appeared on theatre bills, at every corner of the street, that the name of ‘Boz’ became associated with all that was offensive in the burlesque and low farce of the American stage. In this feeling I once participated. But a year ago, a friend brought Oliver Twist to my room, to help while away a night of illness. He had not read many pages before my prejudices against the author all gave way; and, after my recovery, I was glad to read that charming book by myself, where I could enjoy the full pleasure of those feelings, which the kind hearted writer so well knows how to excite [December 28, 1841]. This was not just one man’s opinion – readers became deeply involved with his characters. Dickens published his novels as serials, and The Old Curiosity Shop appeared through 1840 and 1841. When the ship arrived with the final installment, New York readers stormed the wharf, shouting to people on board, “Is Little Nell alive?” Little Nell was the novel’s saintly heroine, and she had, in fact, died tragically. After Dickens visited this country in 1842, he published American Notes for General Circulation, in which he spoke disparagingly of certain aspects of American life. His first objection was to slavery, with its corruption and violence. In general he deplored our violence and believed that extreme individualism led us to treat others unkindly. He disliked what he considered our scandal-seeking press. From his perspectative commercialism encouraged the exploitation of some people by others, and this prevented us from feeling kindness and attaining a wider perspective. He also objected to the US failing to respect copyright, and reprinting his books without paying him. Finally, he found our standards of cleanliness and health primitive, and was especially sickened by almost universal tobacco chewing and spitting. Wikipedia suggests that Americans were sufficiently offended by these Notes as to boycott the author’s works. There is little evidence of this in the Geneva papers, unless it lies in an apparent absence of Dickens references between 1842 and 1845. The next year, the Daily Gazette published an ad for Sands, Lent and Co.’s American Circus, soon coming to town. Troupe member Mr. Mosely was to “exhibit his original and graphic character of the Pickwick Family” [June 5, 1846]. No one, presumably, thought at this point that Dickens characters might be unpopular in the US. 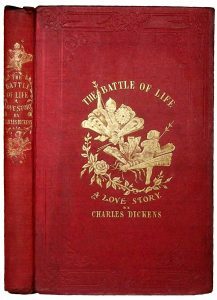 In 1847 Derby and Co. of Geneva advertised “Battle of Life – A love story, by Dickens – his long looked for Christmas story – just received” [Daily Gazette, March 20]. The following year Hollett’s Bookstore offered “The Haunted Man – Dicken’s [sic] New Christmas story” [Daily Gazette, February 2, 1848]. 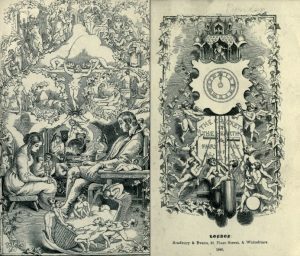 And in 1858, the Courier reprinted an alarming rumor – the English papers were claiming that Dickens was about to quit novel writing, because he could make more money reading or lecturing – “It is to be hoped he will at least, afford us each year a Christmas Story, without which that anniversary could hardly be kept” [May 19]. A Christmas Carole was, in fact, Dickens’s first Christmas story. He wrote four other novellas that he published at Christmastime – A Christmas Carol (1843); The Chimes (1844);The Cricket on the Hearth (1845);The Battle of Life (1846); and The Haunted Man (1848). The surprising thing is that although people called these Christmas stories, and Dickens published them in December, most of them were not explicitly about Christmas. The Cricket on the Hearth, for example, is a story about family misunderstandings, a long lost son, and a mysterious stranger. The stories highlight family sentiment, which perhaps connects them with the holiday. Again, many of these stories do not even mention Christmas. “The Holly Tree,” which sounds Christmassy, is misleading. The title is the name of an inn where the narrator is snowed in, and much of the story consists of him remembering his own and other people’s experiences at inns. “Nobody’s Story” is a plea for social justice, and ends by asking readers to remember the “nobodies” at Christmas and after. That is the only mention of the holiday in the story. “The Haunted House” takes a humorous tone, and proposes that stories of haunting should be shared at Christmastime, but the story does not extend to that time. 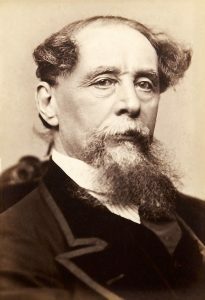 Genevans continued to read about Charles Dickens in the newspapers, buy his books, laugh at his characters onstage, and recite passages from his works for school programs. When he died in 1870, the Daily Gazette reported “. . . the sudden death of CHARLES DICKENS has caused a more heartfelt and universal expression of sorrow than could probably attend the demise of any other man among the notabilities of earth. . . . he was an inmate of almost every household” [June 17, 1870]. On December 3 join Breadcrumbs Productions and the Geneva Historical Society for “A Christmas Carol: Retold” at Rose Hill Mansion. We all know the story but does the story know us? Performances are at 6 pm and 8 pm. Tickets are $20 per person. Space is limited and reservations are required. Call 315-789-5151 for tickets or purchase online at brownpapertickets.com. This is a show you’ll not want to miss!